You have a booth at a trade show and need something to give to attendees. Or your sales reps are making face-to-face calls and need something to leave behind. Or you want a document your website visitors can download. Whatever the case, you need to tell potential customers about your product or service. Three of the most common pieces of marketing collateral are brochures, case studies, and white papers. What’s the difference between them? When should you use each? These tools are all similar in that their purpose is to educate and persuade potential customers so they’ll become actual customers. Where they differ is how they achieve that goal, specifically whom they target, what information they provide, and how they provide it. To illustrate this, let’s pretend we run a company, Acme, that manufactures and sells internet routers. We’ll look at each of our pieces of marketing collateral in turn. Our 4-page, full-color brochure is all about the routers. It shows the various router models Acme produces, along with relevant facts and figures for each. It also includes a brief description of our company, highlighting Acme’s experience and expertise in router manufacturing; a couple of quotations from satisfied customers; and our company’s contact information. All Acme routers include a firewall. Our automatic firewall protects you against malicious attacks from the internet. Our stateful inspection and packet filtering firewall examines every bit of data entering your network to ensure it’s coming from the correct source, protecting you against malicious attacks from the internet. By including the benefits, we help our readers understand how Acme routers will work for them. Brochures are typically used in business-to-consumer selling. Most consumers are typically not interested in the arcane technical details. They just want to know generally what the product does and want some assurance that it will work as advertised. Those who are somewhat technically savvy will appreciate the technical details (like stateful inspection and packet filtering) while those who are not will simply overlook them. What options did they consider? Why did they choose this particular solution (the solution our company provides)? How has it helped them meet their challenges? For example, suppose that in addition to the consumer routers highlighted in our brochure, Acme also manufactures enterprise-class network routers for businesses. Our case study focuses on a company we’ll call BigTechMoney. We begin by giving a brief overview of BigTechMoney, how they’re involved in capital finance and investments for technology firms. They have offices around the world, exchanging highly confidential, proprietary information. Their challenge was securing their communications against hackers. Of course, BigTechMoney chose Acme’s solution, and our case study explains why. First, none of the other options were satisfactory. Our competitor’s products don’t offer the range of features or support our routers do. Outsourcing their network security would have been too costly. And building their own systems would have taken too long and led to security holes. Second, our routers include specialized security features designed to block sophisticated hacking attempts. We briefly explain what these features are and how they work. Third, we offered in-depth technical training and support for BigTechMoney’s IT team, so they’d be able to take full advantage of the capabilities of our routers. Our case study goes on to show how BigTechMoney has benefited from using our routers. In the first month alone they successfully fended off hundreds of attacks, while tying together several satellite offices and dozens of remote users. Our case study includes direct quotes from BigTechMoney’s IT staff and management, gleaned from person-to-person interviews. There are a few graphics: A photograph taken during our training session with BigTechMoney’s staff, and a couple of charts showing the reduction in hacker intrusions after our routers were installed. Case studies like this appeal primarily to business customers. They want to learn how our routers have benefited organizations facing challenges similar to their own. Our 7-page white paper is heavy on facts and figures, light on fluff. While our brochure only briefly mentioned our router’s firewall, and while our case study included our firewall as only one among several benefits to customers, our white paper focuses on one aspect of our firewall technology in detail. Rather than jump right in and show how our routers solve this problem, we discuss several possible solutions, of which ours is just one. And we do so fairly, including both pros and cons of each option. When we finally arrive at the logical conclusion, only then do we offer our routers as the preferred source for the best solution. Despite the name, our white paper isn’t just plain text. It does include some color, but it’s used sparingly. There are no pictures of pretty skylines or families relaxing at home. But there are graphics. We’ve got diagrams showing network routing and charts showing traffic analysis. It may seem counter-intuitive, but our white paper doesn’t even mention Acme until the conclusion of the document. This is because this is a soft sell. Of course the reader knows that we’re marketing to them, but we do so by informing them, by educating them. 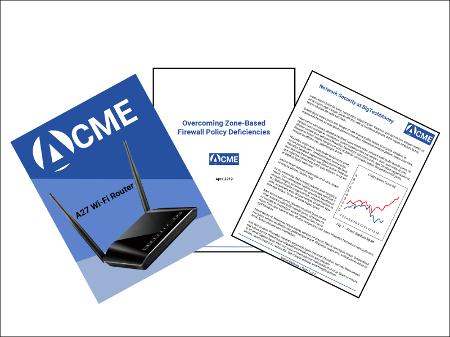 Only once we’ve convinced them that the solution to “zone-based firewall policy deficiencies” we’ve outlined is the best can we offer them a source for that solution, Acme. Obviously, white papers are targeted toward business clients. They’re often used in technical fields, but they can be found anywhere companies are faced with complex issues with various possible solutions. Generally, consumers don’t care about the dry, technical details in a white paper, and they likely won’t identify with the business customers in a case study. Likewise, business managers want something more substantial, detailed, and practical than a brochure, something that addresses the challenges they’re facing. Why not just combine them all into a single one-size-fits-all document? Because it would be cumbersome, inefficient, and irritating. Readers would have to dig through it to find the parts that interest them, while ignoring the rest. White papers – by their length and complexity – require the most effort to produce. They call for extensive research and often incorporate facts from expert third-party sources. Case studies tend to be shorter, but they still require time spent interviewing the customer, identifying the important issues, and conveying the facts in a persuasive way. Although targeted at consumers, brochures also require thoughtful analysis to distill all the information available down into salient points the reader will want to know, as well as an artistic touch to make the document visually appealing. Whatever type of document you decide to use, take the time to do it right and you’ll succeed in turning potential customers into actual customers. Brochures, case studies, and white papers are valuable pieces of marketing collateral that can help you get your message across. But producing them takes time and skill. If you don’t have the time, contact us. We’ll be glad to help.